A fantastic double bill of experimental improv this week, as not one but TWO touring groups stop off to play for us at Long White Cloud. Guitarist Han-earl Park, based in Ireland, brings his top class new trio with Dominic Lash and Mark Sanders, while Sam Andreae (who you might remember from Trio Riot’s gig at LUME last year) and Rodrigo Constanzo travel down from Manchester to bring us their duo project Strikethrough Me And You. This will be a special night of new music, so make sure you can join us. 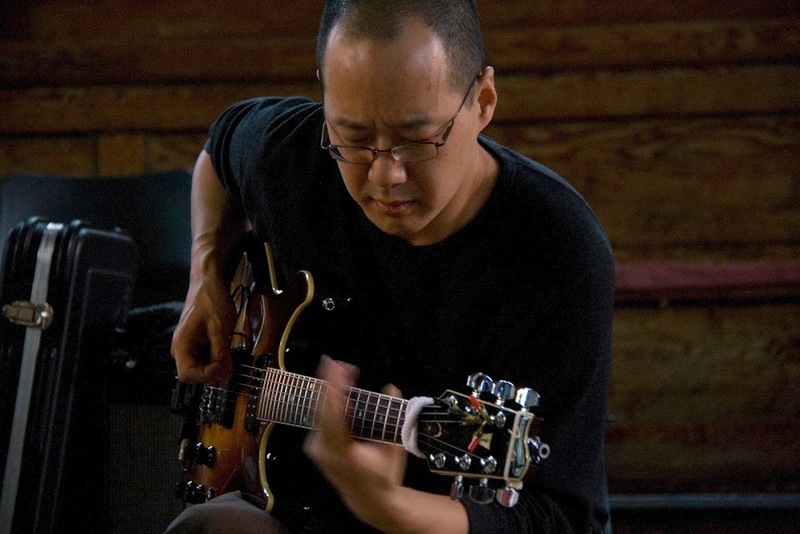 Improviser, guitarist and constructor Han-earl Park has been crossing borders and performing fuzzily idiomatic, on occasion experimental, always traditional, open improvised musics for twenty years. He has performed in clubs, theatres, art galleries, concert halls, and (ad-hoc) alternative spaces across Europe and the USA. Park engages a radical, liminal, cyborg virtuosity in which mind, body and artifact collide. He is driven by the social and revolutionary potential of real-time interactive performance in which tradition and practice become creative problematics. As a constructor of musical automata, he is interested in partial, and partially frustrating, context-specific artifacts; artifacts that amplify social relations and corporeal identities and agencies. Ensembles include Mathilde 253 with Charles Hayward and Ian Smith, Eris 136199 with Nick Didkovsky and Catherine Sikora, and Numbers with Richard Barrett. Park is the constructor of the machine improviser io 0.0.1 beta++, and instigator of Metis 9, a playbook of improvisative tactics. He has performed with Wadada Leo Smith, Paul Dunmall, Evan Parker, Lol Coxhill, Mark Sanders, Josh Sinton, Louise Dam Eckardt Jensen, Gino Robair, Tim Perkis, Andrew Drury, Pat Thomas and Franziska Schroeder, and as part of large ensembles led by Wadada Leo Smith, Evan Parker and Pauline Oliveros. Festival appearances include Freedom of the City (London), Sonorities (Belfast), ISIM (New York), dialogues festival (Edinburgh), CEAIT (Los Angeles) and Sonic Acts (Amsterdam). His recordings have been released by labels including Slam Productions, Creative Sources and DUNS Limited Edition. Dominic Lash is a freely improvising double bassist, although his activities also range much more widely and include playing bass guitar and other instruments; both writing and performing composed music; and writing about music and various other subjects. He has performed with musicians such as Tony Conrad (in duo and quartet formations), Joe Morris (trio and quartet), Evan Parker (duo, quartet and large ensemble) and the late Steve Reid. His main projects include The Dominic Lash Quartet, The Set Ensemble (an experimental music group focused on the work of the Wandelweiser collective) and The Convergence Quartet. Based in Bristol, Lash has performed in the UK, Austria, Finland, France, Germany, the Netherlands, Norway, Spain, Switzerland, Turkey and USA. For nearly a decade he was based in Oxford and played a central role in the activities of Oxford Improvisers; much of 2011 was spent living in Manhattan. In 2013 and 2014 he is taking part in Take Five, the professional development programme administered by Serious. Mark Sanders has played with many renowned musicians from around the world including Evan Parker, Peter Brotzmann, Derek Bailey, Myra Melford, Paul Rogers, Henry Grimes, Roswell Rudd, Okkyung Lee, Barry Guy, Tim Berne, Otomo Yoshihide, Luc Ex, Ken Vandermark, Sidsel Endresen and Jean Francois Pauvrois, in duo and quartets with Wadada Leo Smith and trios with Charles Gayle with Sirone and William Parker. New collaborative projects include ‘Riverloam Trio’ with Mikolaj Trzaska and Olie Brice, ‘Asunder’ with Hasse Poulsen and Paul Dunmall, duos with John Butcher and DJ Sniff, ‘Statics’ with Georg Graewe and John Butcher, and trio with Rachel Musson and Liam Noble. Mark has performed in the USA, Canada, Brazil, Japan, Morrocco, South Africa, Mozambique and Turkey, playing at many major festivals including, Nickelsdorf, Ulrichsburg, Glastonbury, Womad, Vancouver, Isle of Wight, Roskilde, Berlin Jazz days, Mulhouse, Luz, Minniapolis, Banlieue Bleues, Son D’hiver and Hurta Cordel. He has released over 120 CDs. Photo of Han-earl Park by Seán Kelly. This will be the first London gig for the battle/game pieces duo Strikethrough Me And You. They have devised a system of guided improvisation in which the pieces they explore are ‘not really compositions,’ as ‘modes of interaction may be determined, but the content is improvised’. Armed with their experience as improvisers and composers, the two musicians will be navigating this murky and/or fertile territory between the pre-determined and the spontaneous. Duch, David Birchall, Mette Rasmussen, Corey Mwamba, Alex Bonney, Olie Brice, Colin Webster, Marlyn Crispell, Trio Riot, Silence Blossoms and Distractfold Ensemble. Rodrigo Constanzo is a performer and composer living in Manchester. He is an avid improviser and performs regularly using home made electro acoustic, and modified electronic instruments. He is currently working towards a PhD in Composition at the University of Huddersfield and co-runs The Noise Upstairs, an improv collective and label which puts on monthly nights and quarterly workshops in Manchester. Sam and Rod artwork by Angela Guyton. This entry was posted in bass, BATTLE, drums, electronics, game pieces, guitars, improv, joy, laptops, northern friends!, saxes on October 24, 2014 by cath.